This week we have 7 articles to share with you relating to the health of your eyes, please share these articles with your friends and family to promote Eye Health Awareness week 2010, together we can make a difference to encourage regular eye examinations. 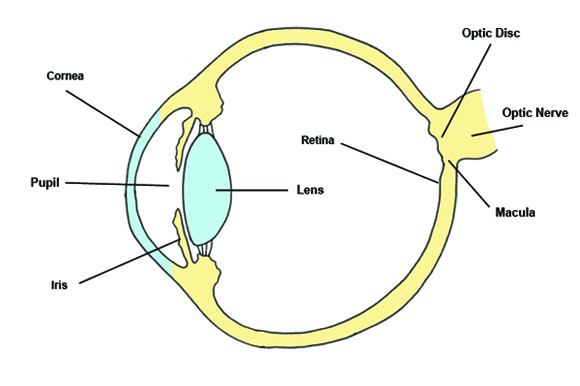 The Macula is a very small part of the retina that converts the light entering the eye into an image. This delicate tissue is situated at the very center of the retina and is accountable for our central vision enabling us to undertake activities such as reading and writing, the macula is also responsible for our ability to see in colour. The delicate cells of the macula may progressively deteriorate over time and eventually stop working altogether. This is sometimes called age related macula degeneration or may also be known as AMD. The condition is found largely in elderly patients and sometimes in middle aged ones too. There are two forms of AMD, usually referred to as ‘Wet’ and ‘Dry’. In general dry macula degeneration is the most common of the two. Dry AMD will gradually deteriorate over a period of a few years; many people notice a gradual central blurring with the peripheral vision unaffected. The colour can also fade similar to an old photograph. For most patients with AMD there is currently no effective medical treatment however low vision aids such as magnifiers can provide some help with reading and close work. Wet AMD is another less common form distinguishable by the formation of new blood vessels growing behind the retina that causes bleeding and scarring resulting in total loss of central vision. If detected early laser treatment can prevent further deterioration of visual acuity. Broadly speaking Wet AMD accounts for about 10% of all AMD cases. The image below shows the same scene as viewed with normal vision, and then with age-related macula degeneration. Age – As the name suggests age related macular degeneration tends to occur in elderly patients. Sunlight – Studies have also shown that macula degeneration has a significant link with UV exposure even though only a small amount of UV actually reaches the retina. Nutrition – Studies have shown that a varied and balanced diet can supply us with all the vitamins and trace elements needed to protect us against AMD. Omega 3 found in oily fish can also help, click here for the BBC news report. Smoking – Smoking has been linked to the development of AMD in various studies. It is also evident that to quit smoking can significantly reduce the risk of developing AMD. Gender – Macula degeneration tends to be slightly more common in women than men. Genetics – Research suggests the likelihood of developing AMD can be linked to a number of genes passed through families. There is a clear message here, and that is to ensure your optometrists closely monitor the health of your eyes by attending regular eye examinations. It is important to understand that a sight test is not simply to check if your prescription has changed since your last eye test but to confirm the general health of your eyes. Tomorrow’s article is on the importance of regular eye examinations. When it comes to the eye most people are in denial of its state until they feel something they can no longer handle or ignore… Only such time that we consult specialist and pay attention to what we do ad what we eat. We should start considering the saying that says prevention is better than cure.